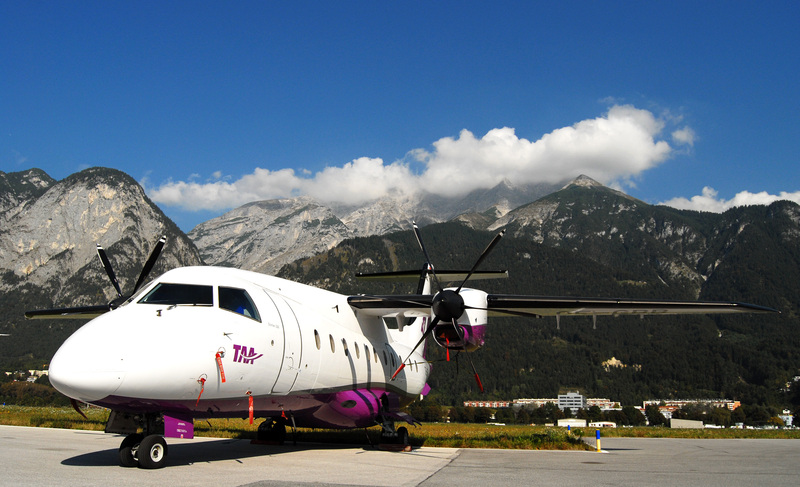 TAA operates its own maintenance centre at Innsbruck Airport for its fleet of 6 aircraft. 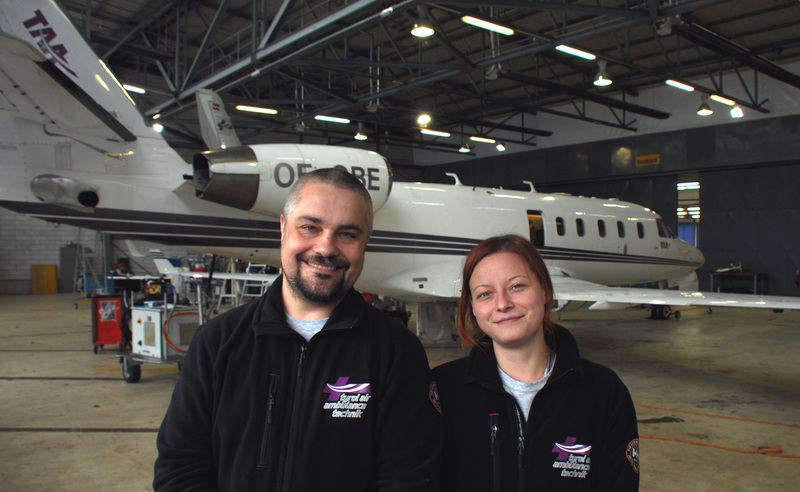 This summer, our Technical Operations team were joined by two Finnish students, Anniina Maronen and Jari Pakarinen for a 10 week work placement from the SASKY/MSSK Aircraft Maintenance Training Programme. TAA Blog caught up with them towards the end of their time at TAA to hear how they got on in Hanger 3. TAA Blog: Can you tell us about your studies? Anniina & Jari: We are both studying to become aircraft mechanics at Mänttä Regional Vocational Education Center, Mänttä-Vilppula, Finland. Mänttä is a beautiful small town in the center of Finland. Our school has the only aircraft mechanic adult study program in Finland. A mandatory part of the studies is a 10 week work placement in an aircraft maintenance company. How did you come to work at TAA? Anniina: Two of our teachers came to visit TAA to open the possibility of sending students here to conduct their practical training. 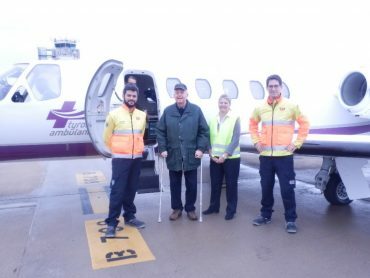 I could have done my work experience close to home in Tampere, Finland, but once I heard that there was a chance to go to Innsbruck, and in particular to an air ambulance maintenance, the decision was easy. Jari: On top of multiple placement opportunities around Finland, our school has some international placement options. For the first time ever, the school offered an opportunity to have our placement here in Innsbruck. I was planning to go to the Canary Islands, sun, warmth, ocean… you know! But just before we were about to select the placements, this new option arose with interesting qualities. The placement at TAA sounded much more interesting than a placement in Las Palmas, so I decided to come here instead. What did you know about TAA before you arrived and what have you learned in your 3 months here? Anniina: I knew that they do the maintenance for their own ambulance aircraft. 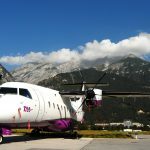 What I didn’t know was that the entire company operations, not just the maintenance, are also run from their base at Innsbruck airport. So it’s like a maintenance company within a company! Jari: Before the placement option was announced at the school, I had never heard about the company. Luckily I guess, as unfortunately, when your company is needed, someone is not doing so well. Before coming here, I did some googling about the company, but that was basically it. Here I have learned a lot. Apart from the main idea of learning aircraft maintenance, I have learned how TAA’s operation is organized (providing medical air transfers, medical assistance, evacuation planning and of course the maintenance of the fleet). The fact that all company operations are located here at Innsbruck airport was one of the biggest reasons for me to select this placement. I was able to get the big picture of company operations, not only the maintenance part. 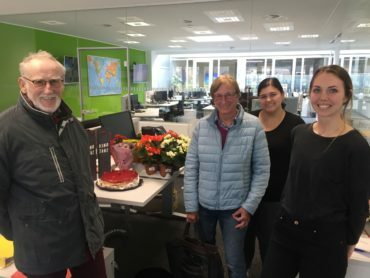 I am happy to say that the company (in particular Verena from Staff Admin) has been very open and helpful in giving this extensive overview of its operations. 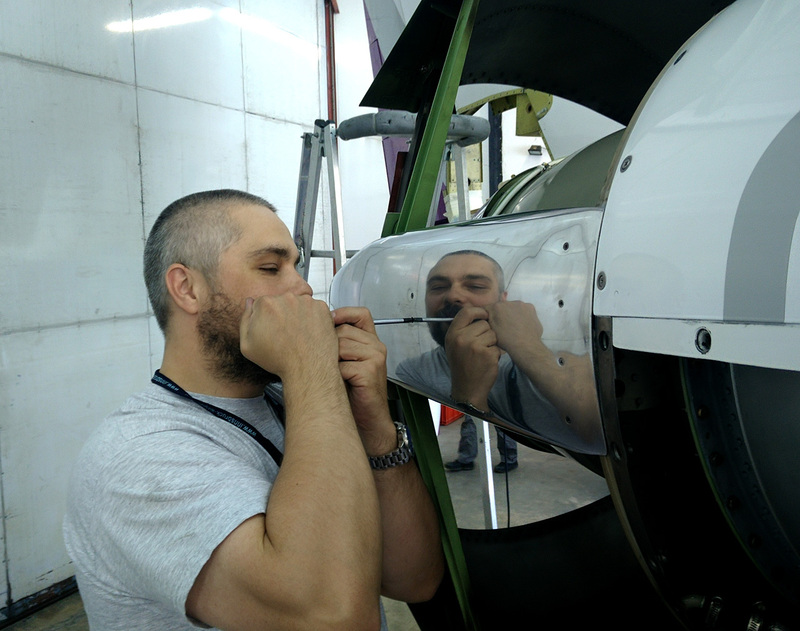 Can you describe what you see as the challenges of maintaining air ambulance aircraft fleet? 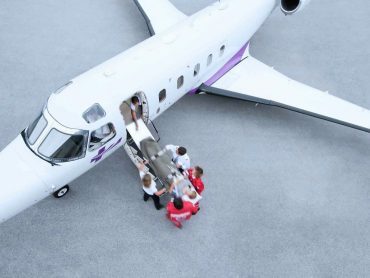 Anniina: Since I don’t have experience of regularly maintaining aircraft, I really cannot describe the challenges of ambulance aircraft too well. My colleagues in maintenance are certainly very busy keeping TAA’s fleet in the air! Jari: From my short time here I would say that the biggest challenge is to maintain three different types of aircraft with such a small amount of personnel. It must be demanding for the mechanics to handle all three types, and even differences between individual aircraft of the same type. With a small group of maintenance crew, they have to be well trained, very qualified, adaptive and ready to learn new things all the time. On the other hand, I am sure it makes working here much more interesting. 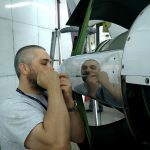 For us trainees, we got a great overview of different types of aircraft, both jet engine and turboprop. Also one advantage is that all different aspects of aircraft maintenance must be managed by almost everyone, excluding some specific jobs that company has outsourced. I’ll give an example, if I would have selected to go for a training period to the main partner for maintenance of the Finnish A­ir Force, I would have only been fixing landing gear or seats for the whole 10 weeks. Here at TAA, everyone does it all. One day you could be fixing tires, next dismantling cabin interiors, then line maintenance for outgoing and incoming aircraft. Finally, as the whole operation is going through Hangar 3, it is possible to talk to the pilots, doctors, cabin crew which is great for getting the big picture. Which is your favorite aircraft in TAA’s fleet and why? Anniina: For me the G100, because I have mostly worked on that aircraft (one of the three G100’s underwent base maintenance during my time here) and personally, it’s the perfect sized aircraft for me, because I can stand in the cabin! Jari: I have been working on the Astra/G100 and Cessna Citation 550 but not with the Dorniers, so they are still a small mystery to me. Listening to mechanics here, some people like certain planes more than others due to their “personal” maintenance qualities and I think that after working on any plane on the fleet you develop sort of special relationship with all individual planes. Maybe I should answer this by saying that I like Dornier best, as I have not had had an opportunity to get to know her yet. Have you noticed similarities between life in Austria (Tyrol) and in Finland? Anniina: We had a really warm summer here in Innsbruck, which I know Jari was happy about! Me on the other hand, I’m happy it’s getting a bit cooler now we are into the autumn. Honestly, I am not a big sun person. For me it’s not so much about the heat, it’s more to do with the brightness of the sunshine. Apart from weather, I noticed that the stores aren’t open as longer as in Finland, and they are shut here completely on Sundays. Alcohol and eating in restaurants is much cheaper here than back home. One final thing that surprised me was that Austrian bars and restaurants have not got a smoking ban. Jari: I have come to the conclusion that living here or back in Finland is basically the same, except here I don’t understand what people are saying! I have been studying the German language since I have been here, but I have not been able to find any language learning material for “Tyrolerisch”, the Tyrolean dialect! Spending free time here seems to be concentrated on the mountains, thought I am not surprised by that. As I have been telling people, the city I live in (Oulu) is built on a rising seabed, so it is mostly flat. The biggest elevation differences are tens of meters high. I keep joking that biggest downhill is the under-crossing of a highway! I have really enjoyed the Alps. They are beautiful and show their changing face every day. I am not sure if people at the airport think I am crazy when they see me sitting in front of Hangar 3 on my coffee break and just admiring the view! 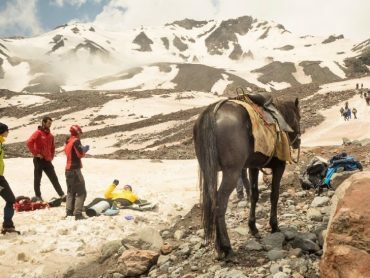 Of course, for many people who have lived here for most of their lives, they don’t go out every day to see if the mountain is still there. Back home for example, we have many auroras, and I have no need to go out every time I hear there is some activity in the sky. What about the people and the food? Anniina: I found the Tyrolean people to be quite reserved, but also more polite here than in Finland. It might have something to do with the language difference. You see, in Finnish there is no specific translation for “bitte” or “please”. That can make us sound quite direct sometimes! In terms of food, I tried Wienerschnitzel and Tyroler Gröstl (local dish of potatoes, meat and onions) which I really enjoyed. Jari: When it comes to people, I would say that the people, their mentality and habits seem quite similar to what I would encounter back home. The food is also quite similar, except for the local specialties, which I have tried whenever possible. Some local foods I really liked, such as Schlutzkrapfen, other dishes like Gröstl are similar to what we have in Finland, while some types of dumplings will I try to avoid in the future if possible! How did you communicate with your colleagues in Technical Operations? Anniina: Since I don’t speak German or this Tyrolean dialect, we have been speaking English to our colleagues. I’m generally a quiet person, so doing the late shift was really a good opportunity for me to get to know people better, as there were fewer people around and I think we all felt more comfortable speaking English. Jari: Apart from the Tyrolean dialect which I was this warned about back home by my German speaking friends, all the people at work speak English and the majority of folks I have come across the city have talked at least enough English to things get done. In work, the guys in maintenance can all speak English of course. I tried to pick up what I could from the German being spoken and steer the conversation back to English so I could be part of the conversation. Do you have any particular personal highlights from your time at TAA? Anniina: A highlight for me was the late shift week, which suited me as I am not much of a morning person! It was also nice to get to know the maintenance team better in that smaller group. I’d also like to mention the amazing people here at TAA. 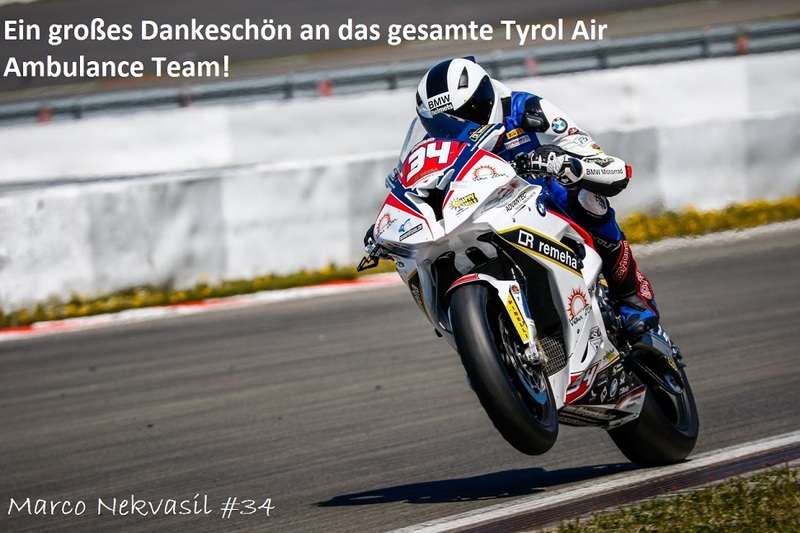 For example, I really appreciated when Heinz and Sebastian, two of our colleagues in maintenance, took us to a local Tyrolean restaurant which was a great experience. Jari: The best parts have been the times when I have been given an interesting task to complete on my own. It was not often, as TAA must comply with national and international rules, which limits what someone can do during a work experience. I tried to help wherever I could, and to learn a lot from observing the maintenance guys at work and asking plenty of questions! Outside of work, one of the best accomplishments was my ride on a cable car up to Hafelekarspitze (2,334m). I have fear of heights so I was quite skeptical whether I would make it to the top, or even on the cable car itself, but I did. The cable car was in the clouds most of the time, which maybe helped me, I don’t know! TAA Blog would like to thank Anniina and Jari for their help with the interview and wish them all the best for their future careers. Hyvää jatkoa! Jari’s favourite… TAA’s Dornier 328!